At the time of the interview Tom Lorcan was starring as Tony (Billy’s brother) in Billy Elliot The Musical at the Victoria Palace Theatre London. Set in the North East, Billy Elliot is the celebration of one young boy’s dream. The story is about the coming of age of a boy. He experiences a love for dance and wishes to embark on a career that is initially against his father’s wishes. Billy begins a journey through a world of picket lines and family difficulties. Tom was born on 19th January, 1982 in Leeds West Yorkshire. After leaving primary school he attended Leeds City High School in Woodhouse, Leeds. He trained in Theatre Acting at Bretton Hall, Wakefield, gaining a Higher Education Diploma, and was then awarded a scholarship to Mountview Academy of Theatre Arts in Wood Green, North London, from which he graduated with a 1st class degree in Performance. In 2006 Tom was selected straight from a Mountview Showcase to make his professional debut as Perkins in the “Blood Brothers“ national tour, and went on to appear in “Dalziel & Pascoe” (BBC) in the same year. During pantomime season in 2006 he appeared in Alice In Wonderland with the Birmingham Repertory Theatre Company. In 2007 Tom played in Lindsay Posner’s revival of “Fiddler On The Roof” at the Savoy Theatre, London. From March 2008 to 2010 Tom was among the original cast of Jersey Boys, playing Donnie. Having seen Tom recently in an outstanding performance as Tony, I am sure that he will have a long and successful career ahead of him on the stage. If you haven’t seen Billy Elliot The Musical then you really should get a ticket and go and see it, it is a fantastic musical that is entertaining and also an inspirational and emotional insight into part of our country’s history. I recently asked Tom some questions about himself and his career. Billy Elliot is clearly a highly emotional musical, what is it like working on the show? It’s very full on, but great fun. It’s like a family on and off-stage and the emotional nature of the show means that we all invest a lot into it. We spend a lot of time rehearsing and the show constantly changes with small tweeks here and there. Also we often have new children starting and finishing their time in the show so the process is constant and exciting. I love it! Being born in Yorkshire and studying drama there, with its many mining communities, do you feel a particular emotional connection with the musical? Yeah absolutely. I was very young when it all happened but it was always something I was aware of growing up. The communities local to me that were affected most are still suffering from it even today. They were stripped of their industry and livelihood and there was nothing to replace the jobs that everyone relied on so heavily. It’s very sad and shows like Billy Elliot are important in reminding us of our recent history. Where did you go to school – what was your favourite subject? I went to City of Leeds High School. It was a daily negotiation to leave the building alive but my favourite subject was probably Geography – I was interested in everywhere else but Leeds. I gather that the first play that you saw was when you were 16, at the West Yorkshire Playhouse called Dealers Choice, was it that play that inspired you to be an actor or was it at another time? It was at Sixth Form College really, I think! It was all sort of around the same time. I didn’t know what I wanted to do but I picked Theatre Studies as an A-Level, mainly as a bit of a doss, but ended up enjoying the performing side of things. What did your parents say when you decided to be an actor? I don’t think I ever told them. I think they may secretly be hoping that I might still grow out of it. Do you have favourite memories of life at Bretton Hall, Wakefield, where you studied drama? I was an incredible place to study. I loved my time there. The location is spectacular and the quality of training was really good. However with it being so isolated as a place, and not being an affiliated drama school I felt like I needed to do some drama training in London as well so I could get more in touch with the business side of things etc. I have been lucky to have a few inspiring teachers along the way. My primary school teacher Mr. Howdle was very creative and our classroom projects always included music, art and drama. And my Theatre Studies tutor at Sixth Form, Graeme Brown always pushed me in the right direction – he was the one who recommended Bretton Hall to me. Just to be happy and keep working. Eventually I would like to live abroad by the sea but I can wait. There are so many to choose from. Ralph Fiennes is always great and plays such a variety of roles so he is probably my top choice. I’ve just moved to Crouch End because I love it there. It’s got a real community feel to it. And Muswell Hill is nearby and that is a lovely place. What is your favourite musical & favourite film? 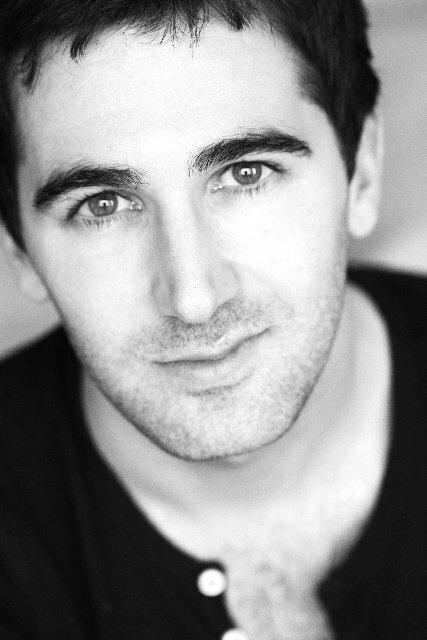 Favourite musical is probably Jersey Boys – I had loads of fun doing that show and it’s a fantastic true story. My favourite film is Robin Hood Prince of Thieves – stuck with me from childhood! Do you have a partner – anything about them? I live with my partner, Emily Shaw, in Crouch End. She’s an actress and was just in the amazing RSC production of Matilda. We met when we were both out of work and got our jobs in Billy Elliot and Matilda on the same day!! Jedward. In a play. Maybe a nice Chekhov piece… or a Pinter. What do you usually do on your ‘nights off’? REST!! Days off are precious when you work on Billy Elliot. Being a Leeds Utd fan – what is the greatest game you have experienced watching? Well it’s no picnic supporting Leeds but my greatest memory was watching an FA cup replay against lowly Walsall at Elland Road – it was the perfect cup tie. It was a night game, it was raining, we had a terrible referee, we were struggling but eventually drew 2-2 at full time – then smashed them 5-2 in extra time. Brilliant!